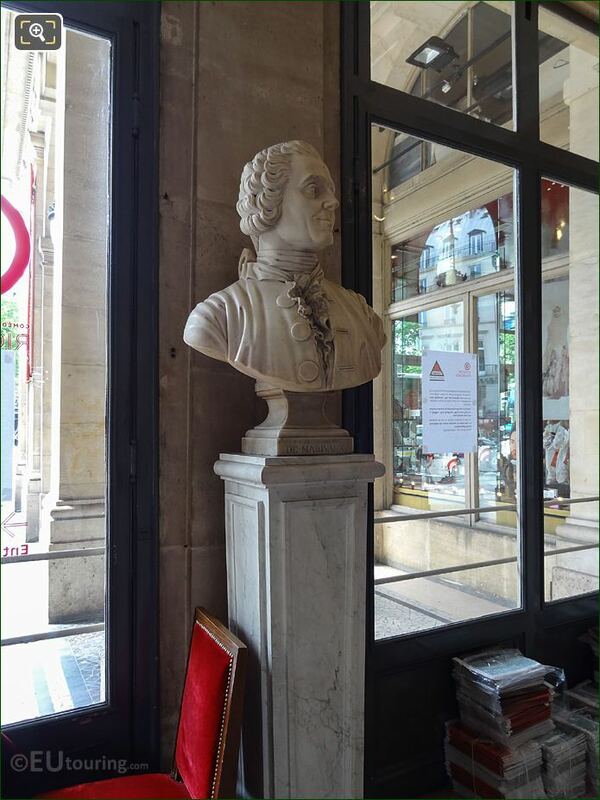 We were at the Comedie Francaise in the 1st Arrondissement of Paris, when we took these high definition photos showing a bust of Pierre Carlet de Chamblain de Marivaux, which was sculpted by Jean-Jacques Caffieri. 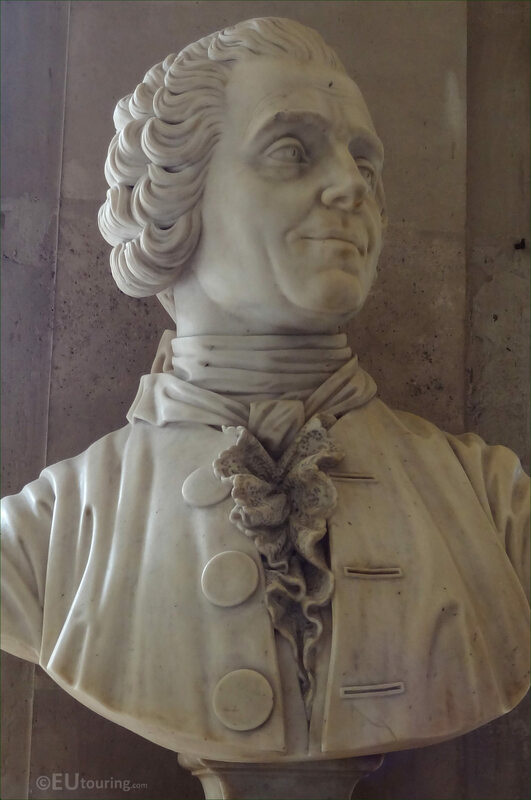 This first HD photo shows a portrait bust depicting Pierre Carlet de Chamblain de Marivaux, normally just known as Marivaux, and made of marble this is located inside the Comedie Francaise, which is a state owned theatre with its own troupe of actors that is also referred to as the Theatre Francais or the Theatre de la Republique. 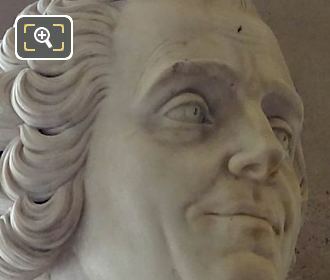 Here you can see a close up showing the detailing that went into producing this marble bust, which was by Jean-Jacques Caffieri who was of Italian origin, yet born in Paris in 1725 following in his fathers footsteps to become a sculptor, with his speciality being busts of famous people that he produced in either terracotta or marble. 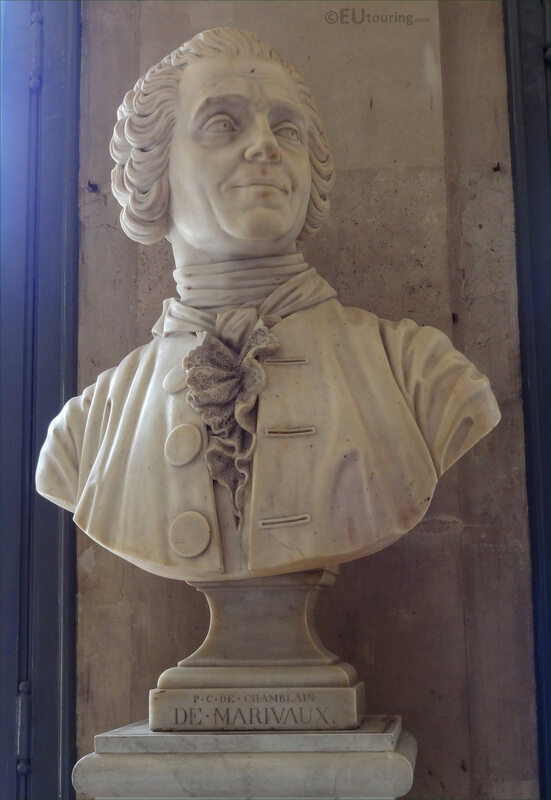 Appointed a sculpteur du Roi to King Louis XV, Jean-Jacques Caffieri received many commissions for portrait statues and busts, including several that are located within the Comedie Francaise, along with others now found throughout the world in places such as the UK, USA, Russia, etc, but we have not been able to find out the exact date that this bust was sculpted. 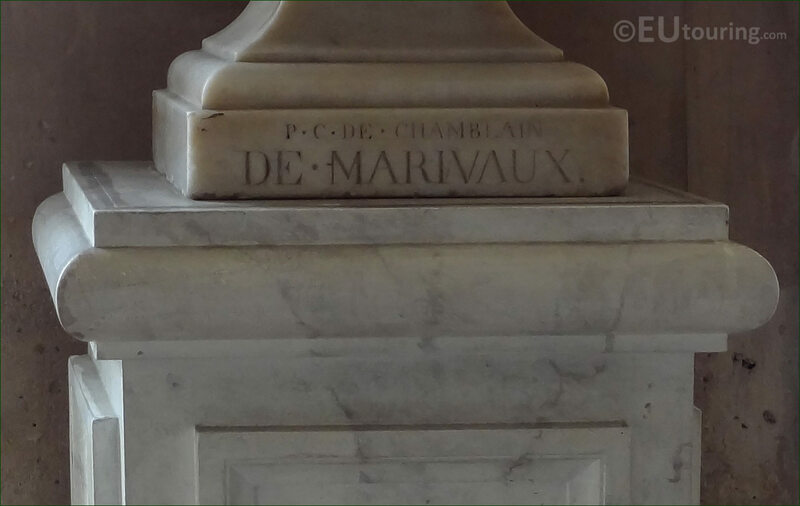 Here you can see a name inscribed into the base of the marble bust that reads P C de Chamblain de Marivaux, referring to the full name of Pierre Carlet de Chamblain de Marivaux, however, according to some sources he was baptised just with the name Pierre Carlet, but in 1716 started signing his name Carlet de Marivaux. 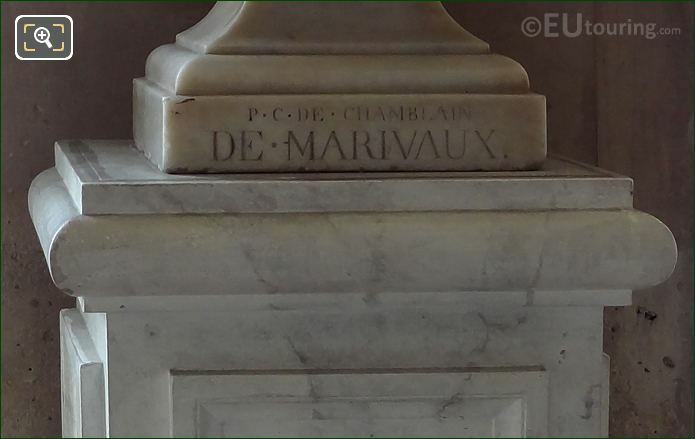 Usually just known as Marivaux, he became a journalist, novelist and a prolific playwright and is considered one of the most important French playwrights of the 1700s who wrote numerous plays as comedies for the Comedie Francaise and the Comedie Italienne, with probably the most recognised being called Jeu de l'amour et du hasard, which in English translates to the Game of Love and Chance. However, this photograph shows the location of the Marivaux marble bust that has been positioned on the top of a tall pedestal within the foyer of the Comedie Francaise, with this theatre being located in a part of the Palais Royal complex on the Rue de Richelieu at the Place Colette since 1799.